"Marley" redirects here. For other uses, see Bob Marley (disambiguation) and Marley (disambiguation). After the Wailers disbanded in 1974, Marley pursued a solo career upon his relocation to England that culminated in the release of the album Exodus in 1977, which established his worldwide reputation and produced his status as one of the world's best-selling artists of all time, with sales of more than 75 million records. Exodus stayed on the British album charts for fifty-six consecutive weeks. It included four UK hit singles: "Exodus", "Waiting in Vain", "Jamming", and "One Love". In 1978 he released the album Kaya, which included the hit singles "Is This Love" and "Satisfy My Soul". Diagnosed with acral lentiginous melanoma in 1977, Marley died on 11 May 1981 in Miami at age 36. He was a committed Rastafari who infused his music with a sense of spirituality. He is considered one of the most influential musicians of all time and credited with popularising reggae music around the world, as well as serving as a symbol of Jamaican culture and identity. Marley has also evolved into a global symbol and inspired numerous items of merchandise. Robert Nesta Marley was born on the farm of his maternal grandfather in Nine Mile, Saint Ann Parish, Jamaica, to Norval Sinclair Marley (1885–1955) and Cedella Booker (1926–2008). Norval Marley was a white Jamaican originally from Sussex, England, whose family claimed Syrian Jewish origins. Norval claimed to have been a captain in the Royal Marines; at the time of his marriage to Cedella Booker, an Afro-Jamaican then 18 years old, he was employed as a plantation overseer. Though Bob Marley was named Nesta Robert Marley, a Jamaican passport official would later reverse his first and middle names. Norval provided financial support for his wife and child but seldom saw them as he was often away. Bob Marley attended Stepney Primary and Junior High School which serves the catchment area of Saint Ann. In 1955, when Bob Marley was 10 years old, his father died of a heart attack at the age of 70. Marley’s mother went on to marry Edward Booker, an American civil servant. The relationship brought Marley two American brothers: Richard and Anthony. 1969 brought another change to Jamaican popular music in which the beat slowed down even further. The new beat was a slow, steady, ticking rhythm that was first heard on the The Maytals song “Do the Reggay." Marley approached producer Leslie Kong, who was regarded as one of the major developers of the reggae sound. For the recordings, Kong combined The Wailers with his studio musicians called Beverley's All-Stars, which consisted of the bassists Lloyd Parks and Jackie Jackson, the drummer Paul Douglas, the keyboard players Gladstone Anderson and Winston Wright, and the guitarists Rad Bryan, Lynn Taitt, and Hux Brown. As David Moskowitz writes, “The tracks recorded in this session illustrated the Wailers’ earliest efforts in the new reggae style. Gone are the ska trumpets and saxophones of the earlier songs, with instrumental breaks now being played by the electric guitar.” The songs recorded would be released as the album The Best of The Wailers, including tracks “Soul Shakedown Party,” “Stop That Train,” “Caution,” “Go Tell It on the Mountain,” “Soon Come,” “Can’t You See,” “Soul Captives,” “Cheer Up,” “Back Out,” and “Do It Twice”. Bob Marley's flat in 1972 at 34 Ridgmount Gardens, Bloomsbury, London. The Wailers were scheduled to open seventeen shows in the US for Sly and the Family Stone. After four shows, the band was fired because they were more popular than the acts they were opening for. The Wailers broke up in 1974 with each of the three main members pursuing a solo career. The reason for the breakup is shrouded in conjecture; some believe that there were disagreements amongst Bunny Wailer, Peter Tosh, and Marley concerning performances, while others claim that Wailer and Tosh simply preferred solo work. In July 1977, Marley was found to have a type of malignant melanoma under the nail of a toe. Contrary to urban legend, this lesion was not primarily caused by an injury during a football match that year, but was instead a symptom of the already-existing cancer. Marley turned down his doctors' advice to have his toe amputated, citing his religious beliefs, and instead the nail and nail bed were removed and a skin graft taken from his thigh to cover the area. Despite his illness, he continued touring and was in the process of scheduling a world tour in 1980. Marley appeared at the Stanley Theater (now called The Benedum Center For The Performing Arts) in Pittsburgh, Pennsylvania, on 23 September 1980; it was his last concert. 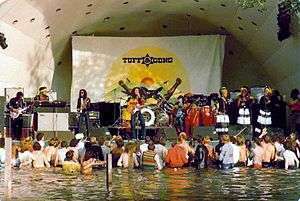 The only known photographs from the show were featured in Kevin Macdonald's documentary film Marley. According to Marley's biographers, he affiliated with the Twelve Tribes Mansion, one of the Mansions of Rastafari. He was in the denomination known as "Tribe of Joseph", because he was born in February (each of the twelve sects being composed of members born in a different month). He signified this in his album liner notes, quoting the portion from Genesis that includes Jacob's blessing to his son Joseph. Archbishop Abuna Yesehaq baptised Marley into the Ethiopian Orthodox Church, on 4 November 1980, shortly before his death. 1976: Band of the Year (Rolling Stone). June 1978: Awarded the Peace Medal of the Third World from the United Nations. Internationally, Marley's message also continues to reverberate among various indigenous communities. For instance, the Australian Aborigines continue to burn a sacred flame to honour his memory in Sydney's Victoria Park, while members of the Amerindian Hopi and Havasupai tribe revere his work. There are also many tributes to Bob Marley throughout India, including restaurants, hotels, and cultural festivals. ↑ Jason Toynbee (8 May 2013). Bob Marley: Herald of a Postcolonial World. John Wiley & Sons. pp. 1969–. ISBN 978-0-7456-5737-0. Retrieved 23 August 2013. ↑ Lou Gooden (2003). Reggae Heritage: Jamaica's Music History, Culture & Politic. AuthorHouse. pp. 293–. ISBN 978-1-4107-8062-1. Retrieved 25 August 2013. ↑ Bunny Lee Interview at Reggae Vibes. Interviewer: Peter I. Retrieved 23 August 2013. ↑ Aston "Family Man" Barrett Interview at Pure Guitar. Interviewer: Jas Obrecht. Published 19 February 2013. Retrieved 23 August 2013. Archived 6 December 2013 at the Wayback Machine. ↑ Mcateer, Amberly (15 October 2014). "Deadly profitable: The 13 highest-earning dead celebrities". The Globe and Mail. Retrieved 21 October 2014. ↑ Nielsen Business Media, Inc. (6 October 2007). Billboard. Nielsen Business Media, Inc. pp. 42–. ISSN 0006-2510. Retrieved 23 August 2013. ↑ Jon Masouri (11 November 2009). Wailing Blues – The Story of Bob Marley's Wailers. Music Sales Group. pp. 242–. ISBN 978-0-85712-035-9. Retrieved 7 September 2013. ↑ Moskowitz, David Vlado (2007). Bob Marley: A Biography. Greenwood Publishing Group. pp. 13–. ISBN 978-0-313-33879-3. Retrieved 10 September 2013. ↑ Observer Reporter, "Ziggy Marley to adopt Judaism? ", The Jamaica Observer, Thursday, 13 April 2006: "Of further interest, Ziggy's grandfather Norval, is of Syrian-Jewish extraction... This was confirmed by Heather Marley, who is the daughter of Noel Marley, Norval's brother." ↑ Jean-Pierre Hombach, Bob Marley: The Father of Music, Lulu, 2012 (ISBN 9781471620454), p. 52: "Marley family members, such as Norval's nephew Michael George Marley, have stated that he was a descendant of Syrian Jews... Michael George Marley revealed:"... I was told by my mother, grandmother and uncle, [that] the Marleys were Syrian Jews who migrated from the Middle East to England and then to Jamaica." ↑ The Real Revolutionary, by Rob Kenner, Vibe, May 2006, Vol. 14, No. 5 (Vibe Media Group ISSN 1070-4701), p. 118. ↑ Stephen Davis wrote that "his name was changed from Nesta Robert to Robert Nesta Marley, at the suggestion of the passport clerk, who thought Nesta sounded like a girl's name." ↑ Stepney Primary and Junior High School Bob Marley Foundation. Published 16 September 2009. Retrieved 1 September 2013. ↑ Bob Marley (31 January 2012). Listen to Bob Marley: The Man, the Music, the Revolution. Open Road Media. pp. 65–. ISBN 978-1-4532-2494-6. Retrieved 1 September 2013. 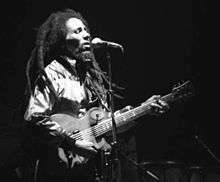 ↑ "Bob Marley's Family Settles Lawsuit With Singer's Half-Brother". rollingstone.com. Retrieved 4 December 2016. ↑ "Cedella Marley Booker: Keeper of the Marley flame". independent.co.uk. 11 April 2008. Retrieved 4 December 2016. ↑ The Last Wailer – Bunny Wailer interview at GQ. Interviewer: John Jeremiah Sullivan. Published January 2011. Retrieved 22 October 2013. ↑ Cunningham, Jonathan (15 April 2008). "Memorial Services for Cedella Marley Booker Tonight". miaminewtimes.com. Retrieved 4 December 2016. ↑ Bob Marley’s Early Years: From Nine Miles To London Jas Obrecht Music Archive. Retrieved 8 November 2013. ↑ Junior Braithwaite interview at iration. Date: 5 May 1985. Interviewer: Roger Steffens. Retrieved 7 November 2013. ↑ Chuck Foster, "Joe Higgs – No Man Could Stop The Source". Retrieved 12 November 2013. ↑ Jon Pareles, "Joe Higgs, 59, Reggae Performer; Taught a Generation of Singers", New York Times, 22 December 1999. Retrieved 12 November 2013. ↑ Bob Marley Solo, 1962 Wailer – The Bob Marley Compendium. Retrieved 8 November 2013. ↑ "The Beverley Label and Leslie Kong: Music Business". bobmarley.com. Archived from the original on 21 June 2006. ↑ Nielsen Business Media, Inc. (16 July 1994). Billboard. Nielsen Business Media, Inc. pp. 92–. ISSN 0006-2510. ↑ Ranglin Interview with Angus Taylor (11 February 2011). Retrieved 6 November 2013. ↑ "The Wailers'Biography". Vital Spot. Archived from the original on 10 September 2007. Retrieved 1 October 2009. ↑ White, Timothy (25 June 1981). "Bob Marley: 1945–1981". Rolling Stone. Jann Wenner. Archived from the original on 21 April 2009. ↑ Moskowitz, David Vlado (2007). The Words and Music of Bob Marley. Westport, Connecticut: Greenwood Publishing, p. 16. ISBN 0-275-98935-6, ISBN 978-0-275-98935-4. 1 2 Moskowitz, David V. "Rebel Music, 1970–1975." The Words and Music of Bob Marley. Westport, CT: Praeger, 2007. 23. Google. Praeger Publishers, Greenwood Publishing Group, 2007. Web. 5 October 2016. <https://books.google.com/books?id=QPZEqZHKq2AC&q=Beverley%27s+All-Stars#v=snippet&q=Beverley's%20All-Stars&f=false>. 1 2 3 McKinley, Jesse (19 December 2002). "Pre-reggae tape of Bob Marley is found and put on auction". The New York Times. Retrieved 4 January 2009. ↑ Muir, Hugh (27 October 2006). 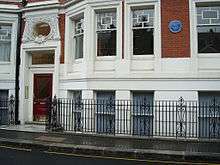 "Blue plaque marks flats that put Marley on road to fame". The Guardian. UK. Retrieved 7 September 2010. ↑ Lloyd Bradley (30 August 2001). Bass Culture: When Reggae Was King. Penguin Adult. pp. 522–. ISBN 978-0-14-023763-4. 1 2 3 4 5 6 Hagerman, Brent (February 2005). "Chris Blackwell: Savvy Svengali". Exclaim.ca. Archived from the original on 27 April 2012. Retrieved 29 December 2010. ↑ Quoted in the liner notes to 2001 reissue of Catch a Fire, written by Richard Williams. ↑ George Terry Interview Hit Channel. Interview: June 2011. Retrieved 10 November 2013. ↑ Nielsen Business Media, Inc. (14 September 1974). Billboard. Nielsen Business Media, Inc. pp. 64–. ISSN 0006-2510. ↑ "Bob Marley Biography". admin. 9 August 2010. Retrieved 4 December 2016. ↑ Nielsen Business Media, Inc. (15 November 1975). Billboard. Nielsen Business Media, Inc. pp. 69–. ISSN 0006-2510. Retrieved 8 September 2013. ↑ Nielsen Business Media, Inc. (25 December 1976). Billboard. Nielsen Business Media, Inc. pp. 77–. ISSN 0006-2510. Retrieved 2 September 2013. ↑ "The shooting of a Wailer". ↑ Walker, Jeff (1980) on the cover of Zap Pow's LP Reggae Rules. Los Angeles: Rhino Records. ↑ "A Timeline of Bob Marley's Career". Thirdfield.com. Retrieved 3 October 2009. ↑ "One Love Peace Concert". Everything2.com. 24 May 2002. Retrieved 3 October 2009. ↑ White, Timothy (28 December 1978). "Babylon by Bus review". Rolling Stone. Jann Wenner. Archived from the original on 16 February 2009. Retrieved 3 October 2009. ↑ Morris, Chris (16 October 1980). "Uprising review". Rolling Stone. Jann Wenner. Archived from the original on 24 October 2007. Retrieved 3 October 2009. ↑ Schruers, Fred (1 September 1983). "Confrontation review". Rolling Stone. Jann Wenner. Archived from the original on 25 February 2007. Retrieved 3 October 2009. ↑ Gooding, Dr. Cleland (11 April 2011). "A Death by Skin Cancer? The Bob Marley Story". The Tribune (Nassau). Archived from the original on 17 April 2011. Retrieved 26 July 2011. ↑ Silvera, Janet (22 February 2014). "Marley Sings Of Love As Cindy Fills His Heart". Jamaica Gleaner. Retrieved 22 February 2014. ↑ Slater, Russ (6 August 2010). "The Day Bob Marley Played Football in Brazil". Sounds and Colours. Retrieved 6 August 2010. ↑ Scott, David Meerman (20 April 2012). "Bob Marley and me". Web Ink Now. Retrieved 30 July 2015. Marley's last show was a critical aspect of the film and there was no video or photo record... except mine. ↑ "His story: The life and legacy of Bob Marley". web.bobmarley.com. Archived from the original on 17 April 2009. Retrieved 4 October 2009. ↑ "Why Did Bob Marley Die – What Did Bob Marley Die From". Worldmusic.about.com. Retrieved 31 October 2011. ↑ "Bob Marley's funeral program". Orthodoxhistory.org. Retrieved 4 June 2010. ↑ "30 Year Anniversary of Bob Marley's Death". Orthodoxhistory.org. Retrieved 11 May 2011. ↑ "Bob Marley". Find a Grave. 1 January 2001. Retrieved 16 April 2009. ↑ Williams, Richard. "Bob Marley's funeral, 21 May 1981: a day of Jamaican history". the Guardian. Retrieved 17 October 2015. ↑ Marley, Rita. No Woman, No Cry: My Life with Bob Marley. ↑ White, Timothy. Catch A Fire: The Life Of Bob Marley:. ↑ Jason Toynbee (2013). Bob Marley: Herald of a Postcolonial World. p. 88. Rita has claimed that she was raped there [Bull Bay] by Bob in 1973 after he returned from London, and asked her to care for another child he was going to have by a woman there (Roper 2004). The formulation changes to 'almost raped' in her autobiography (Marley 2005: 113). But in any event, it seems clear that Bob behaved in an oppressive way towards her, always providing financial support for herself and the children it is true, yet frequently humiliating and bullying her. 1 2 Dixon, Meredith. "Lovers and Children of the Natural Mystic: The Story of Bob Marley, Women and their Children". The Dread Library. Retrieved 21 June 2007. ↑ "Bob Marley's Children". Chelsea's Entertainment reviews. Retrieved 28 December 2009. ↑ "Bob Marley Official Site". ↑ Grant, Colin. The Natural Mystics: Marley, Tosh, and Wailer. p. 113. ↑ Bell, Thomas L. Sound, Society and the Geography of Popular Music. p. 100. ↑ Booth, Martin. Cannabis: A History. pp. 366, 367, 368. ↑ Moskowitz, David Vlado. Bob Marley: A Biography. p. 15. 1 2 Henke 2006, p. 5. ↑ David Vlado Moskowitz (2007). Bob Marley: A Biography. Westport, Connecticut: Greenwood Publishing Group. p. 132. ISBN 978-0275989354. Retrieved 26 September 2013. ↑ "The Best Of The Century". Time. Time Inc. 31 December 1999. Retrieved 16 April 2009. ↑ "Grammy Lifetime Achievement Award for Bob Marley". Caribbean Today. 31 January 2001. Retrieved 4 October 2009. ↑ "The Immortals: The First Fifty". Rolling Stone Issue 946. Jann Wenner. Archived from the original on 6 January 2007. ↑ "Who is the greatest lyricist of all time". BBC. 23 May 2001. ↑ "London honours legendary reggae artist Bob Marley with heritage plaque". AfricaUnite.org. Archived from the original on 20 November 2008. ↑ "Grammy Hall of Fame Awards Complete Listing". Grammy.com. Archived from the original on 24 December 2010. ↑ "Statue of Bob Marley, Kingston, Jamaica". The Independent. Retrieved 23 December 2014. ↑ Mooney, Jake. "Drum Roll for a Sign With a Reggae Beat", The New York Times, 21 May 2006. Accessed 11 October 2007. "On May 10, the City Council approved a plan to hang Bob Marley Boulevard signs beneath the Church Avenue ones along an eight-block section, from Remsen Avenue to East 98th Street." ↑ "Brooklyn Street Renamed Bob Marley Boulevard". NY1. 2 July 2006. Retrieved 6 October 2009. ↑ "n. Marinković, "Marli u Sokolcu"". Politika.rs. Retrieved 31 October 2011. ↑ Singh, Sarina; Brown, Lindsay; Elliot, Mark; Harding, Paul; Hole, Abigail; Horton, Patrick (2009). Lonely Planet India. Oakland, CA: Lonely Planet. p. 1061. ISBN 978-1-74179-151-8. Retrieved 7 July 2011. ↑ "Bob Marley Cultural Fest 2010". Cochin Square. 4 May 2010. Retrieved 7 July 2011. ↑ Rebel Music – The Bob Marley Story (Rita Marley, Bob Marley). 2001. ↑ Winter Miller (17 February 2008). "Scorsese to make Marley documentary". Ireland On-Line. Retrieved 6 March 2008. ↑ "Martin Scorsese Drops Out of Bob Marley Documentary". WorstPreviews.com. 22 May 2008. Retrieved 26 May 2008. ↑ Kevin Jagernauth (2 February 2011). "Kevin Macdonald Takes Over 'Marley' Doc From Jonathan Demme". indieWire. Retrieved 22 February 2012. ↑ "Jamaica premiere for Marley tribute". www.independent.ie. 20 April 2012. Retrieved 20 April 2012. ↑ Miller, Winter (3 March 2008). "Weinstein Co. options Marley". Variety. Reed Business Information. Retrieved 3 March 2008. ↑ Elaine Downs (23 June 2011). "Edinburgh International Film Festival 2011: Bob Marley – the Making of a Legend | News | Edinburgh | STV". Local.stv.tv. Archived from the original on 25 June 2011. Retrieved 26 July 2012. ↑ "Marlon James wins Booker Prize for novel on attempted assassination of Bob Marley". The Washington Post. Retrieved 18 October 2015. Henke, James (2006). Marley Legend: An Illustrated Life of Bob Marley. Tuff Gong Books. ISBN 0-8118-5036-6.